Hooray for Friday! I think it's funny that no matter my schedule I have adapted over the years that Friday always signals the end of the week. It's a way to close out one week and get prepared to start fresh for the next, I like it. Here are my 5 moments of this week so far. . .
1| I consider the plumbing conquest that Martin and I had last Sunday quite the success! The fact that when we turned the water back on we didn't have it squirting to the ceiling was quite amazing to me, I am still in shock (and maybe even disbelief too) that it worked as well as it did! 2| On Monday not only did it reach 65 degrees outside, that also meant for the first time in longer then I can remember I went outside without a coat. I'm not sure if you heard me, WITHOUT A COAT! That feels like a huge major big deal over here. Now of course it was about 35 degrees the next day, but it was such a breath of fresh air, even if it did only last one day! 3| We picked up some new pillows for our bed during a recent Costco trip. It is crazy what a big difference some new pillows can make! It's like new running shoes, you don't think they are that bad until you get new ones. It's once you have the new ones you realize how shot the old ones really are. I swear once my head sinks into the pillow and my eyes fall shut the night goes by in a flash. I really would have no problem feeling like the night took longer to go by, seriously I could deal with it! 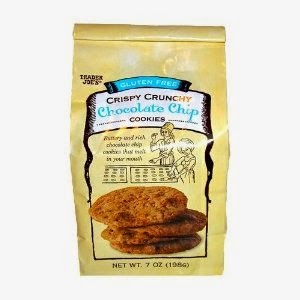 4| Trader Joe's Gluten Free chocolate chip cookies. I just tried them for the first time and they are so good! I normally don't like crispy cookies, usually I would go for the more soft chewy ones. But these, these are good. They are rich and buttery tasting. The only bad thing is there aren't enough of them in the bag! 5| Two weeks from today Martin and I will be in the warmth of the Arizona sun. I can't wait! Countdown has begun! This warm weather get away is SO desperately needed! I just want to feel the warmth of the sun! Can you tell I'm looking forward to this much?!? I hope you've had a good week! I will be in training this weekend for work, but am still hoping to get some work accomplished on the bathroom. I really hope that we will have the tub in by the time Monday rolls around - check back next week to see if we made it happen. Wish us luck, this will be the first bathtub either of us has put in! Have a good weekend!